Clocking systems (also known as time and attendance systems) have come a long way since days of old. Gone are the times when workers had to punch a card to register arrival at work. There’s now a huge range of mobile, dynamic employee clocking in systems with their own intuitive timesheet software. Modern clocking in systems do much more than monitor time and attendance. They provide a flexible solution that works hand in hand with your payroll. A good clocking in system lets you plan timesheets with ease while tracking overtime and holiday requests. We looked at the range of clocking in systems helping relieve the HR woes of UK businesses. 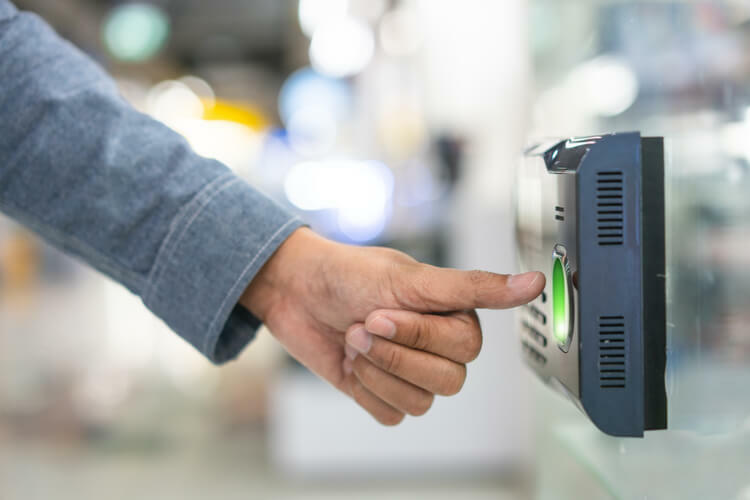 To make our list, these time and attendance systems had to be quick, smart, intuitive and scalable – as suitable for small businesses as medium to large ones. Eager to dive straight in and start comparing quotes? Punch your details into our quick form to start getting to grips with top suppliers. Or read on for the best clocking systems for UK businesses, as chosen by the experts. We crunched the features, the functionality and ease of use of the long list of clocking systems on the market. Our top ten favourites are Bodet, Mitrefinch, Planday, ISGUS UK, TimeTac, Kronos, Chronicle, Clockrite, TimePilot, and ATS. We’ve reviewed each one; click below to navigate to the one of your choice. Bodet’s Kelio clocking-in machines boast visually stunning customisable touch screens, which are a pleasure to use for both employee and employer. The terminals can be combined with a fingerprint sensor, card reader or both. As well as recording information, Bodet’s system can display personal data like holidays, sick days, and overtime to employees when they clock in. It also offers the ability to send time off requests directly to management from the device. Bodet is one of the leading companies in time-related equipment in Europe, and has subsidiaries in several European countries and the UK. The first tower clock was installed by Monsieur Bodet in 1868, and they now produce everything from sports timekeeping boards to clocking software, as well as their excellent Kelio terminals and biometric clocking in devices – launched in 2016. Employers have access to real time attendance data with Bodet systems. They also have options for rota planning and room access control systems. Plus, mobile options and a number of payroll and HR reporting functions. Installation, training, maintenance, and configuration for Bodet clocking systems is all supported by a team of experts based at their headquarters in France. Pricing is tailored to each customer. However you can easily access personalised quotes for your business by using our form. Mitrefinch have a reputation for excellence in managing secure environments and successful fraud prevention. Their clocking in machines are all designed and manufactured in-house and the data can be used for payroll and scheduling. Every mobile option you would expect from a top rated system is included as standard. Mitrefinch is a UK-based company responsible for developing the very first computerised staff clocking system, in the early 1980s. This innovation led to the company being featured for their ‘technology of the future’ on the television program Tomorrow’s World, and they have continued to lead the way with biometric clocking systems. Mitrefinch also have a reputation for developing additional software and systems to suit their clients. This bespoke approach is key to their excellent security. They frequently tailor their technology for larger companies of over 100 employees. There are options for both a one-time license and subscription. Pricing is tailored to each customer and depends on the solution you choose for the unique demands of your business. The Planday app user interface is simple and intuitive. For extremely complex operations more sophisticated reporting may be required. That said, Planday can export clocking data to payroll and be used to generate other kinds of reports. Scheduling with Planday can be difficult to set up initially, but is then easily modified or duplicated afterwards. Planday is a Danish company that has had a UK office since 2014. It is primarily geared towards businesses where people are employed in shifts, and is well reviewed by users online. The employee end of the clocking in system is an app that can be installed onto smartphones and other devices. Workers are able to log their arrival from their phone at a location set by their employer. Planday works a bit like a social networking site, making shift data visible in real time. Employees can swap shifts or vacations, so management need only approve the swap, instead of organising it. The issues with mobile applications are related more to the vulnerabilities of mobile devices, rather than the clocking systems running on them. However, time spent working around a spent battery or lost phone is minimal compared to the time that a clocking system can save employers and employees alike. It is certainly one of the best time and attendance systems for small businesses. Pricing is very reasonable at £2 – £4 per user / month. ISGUS offer modular systems of real-time staff clocking and access control management. Data can be harvested for project management, holiday scheduling and payroll systems. They provide industry-tailored solutions and excel in providing systems that promote flexible and remote working, making the most of mobile and cloud technologies. Their digital employee sign in machines are tamper-proof and elegant. Isgus were founded in 1888. They have gone from patenting mechanical clocks for watchmen to today’s high tech ZEUS biometric equipment and staff management systems. Reviews of customer support are excellent – particularly in urgent cases, when there is a guaranteed two-hour call back time. They also use GoToMeetings for remote video help. The ZEUS user interface works well across a range of mobile devices, tablets, and computers but is better suited to companies with over 25 employees. TimeTac is an Austrian company who aim to provide user-friendly clocking software, to monitor projects, resources, holidays and supply payroll data. The data from this system can be seen in real time, and is cloud based. Software can also be tailored to customers’ needs and updated to adapt to business growth and development. Timetac do not produce their own hardware, but the company has a ‘Green IT philosophy’ meaning they make sure their software is compatible with existing IT infrastructure. One major benefit of using TimeTac is their excellent user manual with a searchable help function, meaning a system can be installed and operational in minutes. Pricing is not the most competitive, but there is a free trial for 30 days. After this, Employee Time tracking will cost roughly £3 per employee and project tracking £6 – 8. Leave tracking will cost you an extra £1 – £1.50. A monthly base fee of around £12 to £15 per account comes with more options. Kronos systems are capable of the complex data triage required by very large companies with thousands of employees in thousands of different roles. They will manage payroll data, make holiday scheduling relatively straightforward, and work with security settings for smart locks that only allow access to selected individuals. Kronos is arguably the most well known of employee clocking systems. The company is based in the US but have offices all over the world. They have a variety of biometric clocking in machines, including fingerprint clocking in machines, but they can be scaled down to track computer login data. On the employer side, their cloud-based approach has the advantage of being modular – so company growth and diversity can be anticipated. Kronos can monitor different roles in different locations and for different pay rates, even if all these things are happening to the same person on the same day – such as doctors working in clinics that specialise in different areas, from research to consulting. The advantage of this level of detail comes in knowing where to place staff for maximum efficiency. Pricing is tailored to each customer. However, you can browse bespoke quotes for your business from Expert Market approved suppliers by jumping into our form. Chronicle comes with over 30 years of experience driving UK businesses. Its cloud-based solution lets you tap into key information relating to your staff, on the go. Chronicle’s intuitive software generates payroll reports and tracks attendance data in real time. Plus, it reckons it can save you about 5% a year on your staffing costs. Not too shabby! Chronicle offers a huge range of clocking devices to match the unique demands of your business. It offers waterproof systems for areas of food production and high splashback. Plus a range of intuitive low cost options – from biometric and smartphone to low cost proximity clocking devices. Chronicle’s clocking systems offer durability and are easily customisable. And the best thing? You’ll get time and attendance data sent straight to your smartphone, tablet, or computer. So no matter where you are in the world, you’ll never miss a trick. Pricing depends on your needs, and you’ll need to enquire with Chronicle. To get stuck in, use our quick form to compare quotes from top suppliers. ClockRite offer a range of clocking systems for small businesses, compatible with various technology including proximity fobs or cards, and fingerprint verification. The systems come with reporting functions and can export data directly to Sage or an excel spreadsheet for payroll creation. The company offers a range of proximity fobs and cards as well as fingerprint clocking machines and innovative facial recognition systems. ClockRite will supply and install their systems for you, then support customers in-house from their head office in Derbyshire. Pricing varies depending on the clocking in systems and hardware purchased. A proximity clocking machine with 25 badges is £282.00 inc. VAT. Wireless fingerprint clocking machines (for up to 25 employees) are £468.00 inc. VAT, and outdoor system cost £450.00 inc. VAT. TimePilot PC is an onscreen clocking system that can serve up to 2,000 employees. This is more like older systems in that there is no employee interface so workers cannot view their data, request holidays or swap shifts. Some might consider this an advantage, and certainly, the reduced staff engagement is reflected in a much cheaper product. The TimePilot corporation is based in the US, where it is led by inventor Douglas Marsh. In addition to their classic TimePilot PC software (read more above), TimePilot also sell time clocking hardware. These are mostly aimed at security systems, but their clocking machines are useful for small businesses. Their hardware has the benefit of being portable (battery powered), making it useful for offsite projects. Data is stored in the device and uploaded to a computer via a cable. This may seem rather old fashioned, but for a small company it could work out as very cost effective. Pricing is roughly £85 for one computer, rising to around £160 to license up to five computers. ATS is another UK company who break their range down into three distinct groups: time and attendance software, the hardware to go with it, and access control systems. They offer a range of cloud-based software with mobile data options and scheduling and resources management. ATS offer a range of clocking machines, from ones that will literally punch a card, to swipe-card systems, to a full range of sophisticated biometric clocking technology. Their machines are originally sourced from competitors such as Bodet but they have their own telephone technical support team. Their dedicated system support operates during business hours Monday to Friday, but remote login and site visits are also available. Pricing will vary according to hardware and software selected. To compare quotes from top time and attendance system providers, just pop your details into this form to get started. Ready to start comparing quotes from the top time and attendance service providers in the UK? No problem. Take a minute to fill out the interactive form at the top of this page and we’ll help find the right solution for your business. Sounds cool, right? A biometric clocking system is one that uses ‘human data’ in the clocking in process. It uses fingerprints, handprints and even facial recognition technology to verify that your employees really are who they say they are. This helps eliminate your staff punching in for each other and helps cut out wasted wage spend. How much does a clocking in system cost? Prices will depend on the kind of hardware you’re after. If you want a lot of people to access your business’ time and attendance data you may have to pay more. Broadly, it’ll depend on the size of the solution you require, the amount of staff you have, and the unique needs of your business as a whole. Even more so, the supplier you choose will make all the difference. Don’t trawl through an ocean of webpages driving yourself mad with hidden fees and dubious-looking pricing structures. Get accurate quotes from quality suppliers, in a matter of moments. What are the benefits of using a clocking in system? Clocking in systems give you accurate information about when your staff are clocking in. Accurate information means accurate wage bills. And getting rid of those perplexing payroll discrepancies will save you time chasing up loose ends. And also save you lots of money! Every employer has heard it. “It’s only five minutes, what’s the big deal?” Well, five minutes late for five days a week equals a big chunk of wasted wages over the course of year. Time and attendance systems empower you the data to detect lateness and help get rid of it. Time and attendance systems let you plan rotas and timesheets as far in advance as you’d like. It’s easy to work around employee absences and factor in sick days. You can cater to the individual schedules of each of your employees, to keep everyone happy. A clocking in system integrates with your HR records and payroll. It cuts out dead time spent juggling employee records and despairing over endless stacks of paper. And with cloud-based T and A systems now more common than ever, you can manage your business from anywhere. Like, a beach maybe?